History is larger than life - and twice as funny - in this monumental comedy sequel. Ben Stiller (Meet The Parents, There's Something About Mary) stars as Larry Daley, a former night watchman at the Museum of Natural History, where the exhibits come alive after dark. But now Larry’s nocturnal friends are being retired to the archives of the Smithsonian Institution, luring him back for a hilarious, all-out battle against a cranky Egyptian Pharaoh who plans to take over the museum... and the world! 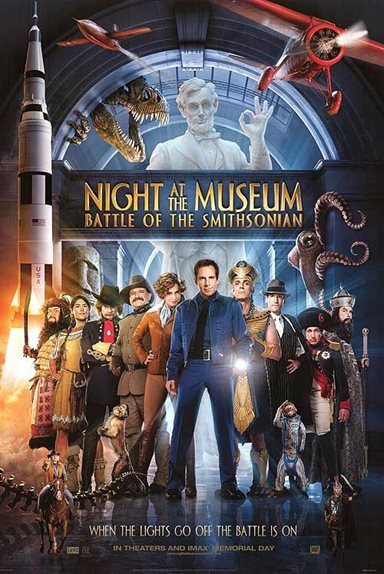 Download Night At The Museum: Battle For The Smithsonian in Digital HD from the iTunes store. Night At The Museum: Battle For The Smithsonian images are © 20th Century Fox. All Rights Reserved. 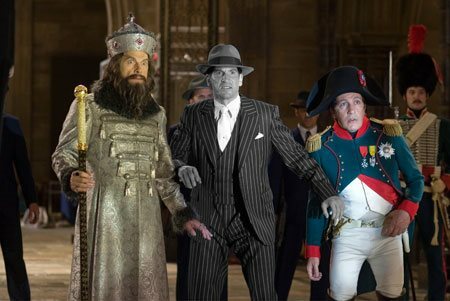 The follow-up to the 2006 "Night at the Museum" reunites Ben Stiller and Owen Wilson for approximately the ninth or tenth time, and Abraham Lincoln and Napoleon for the second time (Bill and Ted was the first). In this franchise, an ancient Egyptian artifact brings the exhibits to life and imbues them with some semblance of their historical persona. In the first movie, Stiller played Larry Daley, a museum security guard, who befriended the personalities when the night crew was trying to steal the "thing" that animated them. This time around, he has become a successful inventor, but has to leave his job to help his friends when he hears that the artifact has been commandeered by an evil Egyptian pharaoh. The pharaoh intends to use it to take over the world. A back-and-forth ensues with various real and imaginary characters coming to life in order to try to get the artifact back into the right hands. Notable is the appearance by Darth Vader, who apparently was only licensed to them under the condition that he came with a handler from Lucas Film and was always on-hand to say what he would and would-not do. The film is fast-paced, unevenly funny, and has good special effects, which I would guess, were considered more important than the plot since they seem to have had much more effort put into them. Stiller gives the same kind of comedy he gave in the first one -- part wise-guy and part hapless victim. The historical references are reasonably clever if not very insightful; although I will note that the Smithsonian did lend their name to the film and apparently gave the crew information about each of the real personas. Will you like it? My daughter liked the first one and when she sees this one, I will lay odds that she will like this one also. I was moderately impressed with the first one and find this to be more of the same. The disc comes with a couple of commentary tracks. Listen to the one by the writers, Robert Ben Grant and Thomas Lennon where there is a lot of making-of stuff and information about the actual Smithsonian, and is very interesting; but if you are that interested, do yourself a favor and find a way to visit in person. There are 12 deleted scenes, and the now standard 'digital copy'. It is a reasonably good edition; the studios understand that people who get a DVD want it full of extras, and I approve of that. 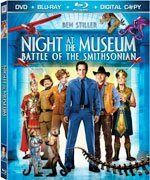 Night at the Museum: The Battle of the Smithsonian is not likely to be anyone's all-time favorite, but it is a respectable sequel to the original and certainly isn't a disgrace. I will give it a tentative 'B' since my daughter hasn't seen it yet, but I suspect she will be very entertained by it. Night At The Museum: Battle For The Smithsonian images © 20th Century Fox. All Rights Reserved.